The September edition of the BeeLines newsletter is available online. 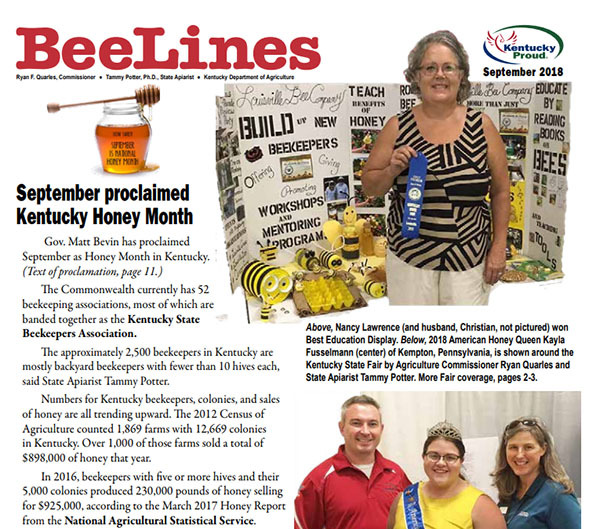 It includes information about September being proclaimed as Kentucky Honey Month, highlights of the State Fair, the State Apiarist’s schedule, our newest Master Beekeeper, and much more. Past BeeLine newsletters can be downloaded from the Kentucky Department of Agriculture’s website (current year only) or from the KSBA Educational Resources for Beekeepers webpage (back to Feb. 2015).